Gettysburg Foundation - Gettysburg Wins Again! Gettysburg has been recognized by the Student and Youth Travel Association (SYTA) as a top destination for student travel. SYTA is the non-profit, professional trade association that promotes student and youth group travel, with members that provide life enhancing travel experiences to students and young people. SYTA establishes high quality and safety standards for travel providers. The vision is to help students and youth gain greater understanding of the world through the experience of travel. 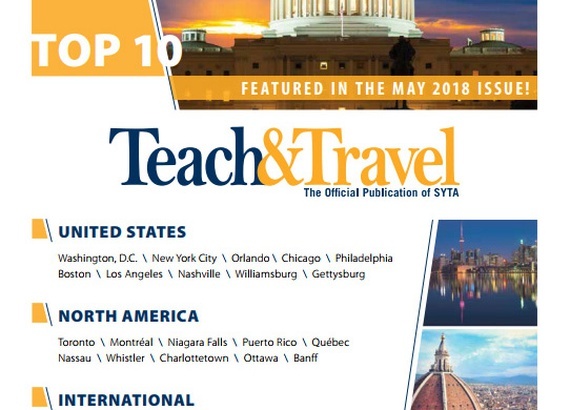 Each year, Teach & Travel—SYTA’s official publication—features the top destinations for student groups as reported by SYTA member tour operators. Gettysburg is in their top ten for 2018. The full list will be published in the May issue of Teach & Travel.